The name ‘Rothschild’ first appeared in the 18th century when Mayer Amschel Bauer established his banking empire in Frankfurt, Germany, and changed the family name. The Bauers were a notorious satanic family in Middle Ages Germany and the major Rothschilds remain master black magicians to this day. Mayer Amschel’s father, Moses Amschel Bauer, was a moneylender and proprietor of a counting house. The Rothschild dynasty is controlled by the family’s satanic magicians who know how reality works and how they can manipulate energy and human perception. They know that money, like everything else, is energy and they have set up the financial system to exploit this knowledge. People talk about ‘flows of money’, but it is really flows of energy and they have created an energetic construct that ensures that the energy of money flows to them. We call this construct the ‘economic system’ or ‘the economy’ and it appears to consist of banks, financial houses, stock markets and other forms of trading; but all of these entities are just acupuncture points on the meridians of money to ensure that the wealth of the world flows to the bloodline families. It is because of this that the Rothschilds count their wealth in multiples of trillions and more. The Rothschilds control the global financial system and have accumulated their power by theft and exploitation. Their whole system is based on a gigantic fraud because there is no money, as we perceive it. 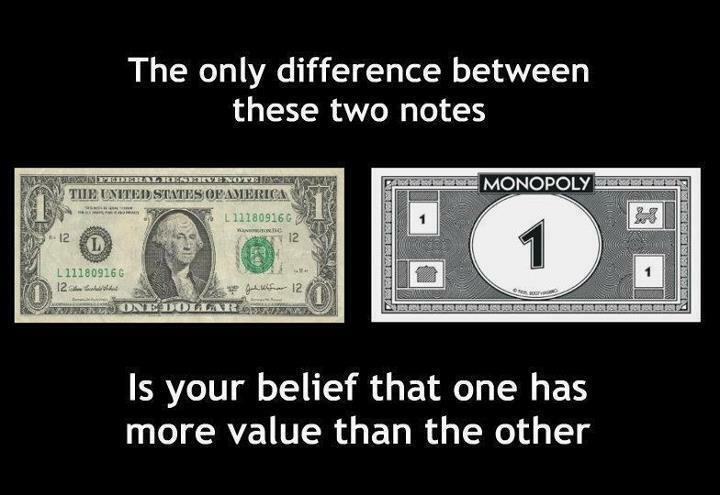 The paper money and coins are backed by nothing. Their value is only the value that we can be persuaded they have. They are just worthless pieces of paper (a promise-to-pay or promissory note) and pieces of metal that we are tricked into taking seriously. Most ‘money’ is not even something you can hold today; it is only figures on a computer screen. ‘Money’ is brought into circulation through what is called ‘credit’, but this ‘credit’ is a belief-system, that’s all – a belief that it exists. The banks are not lending us anything – they are creating it – and people are paying them a fortune to do so. The bloodline families, particularly the Rothschilds, have controlled governments and banking for centuries and they have been able to dictate the laws of the financial system and introduce what is called ‘fractional reserve lending’. 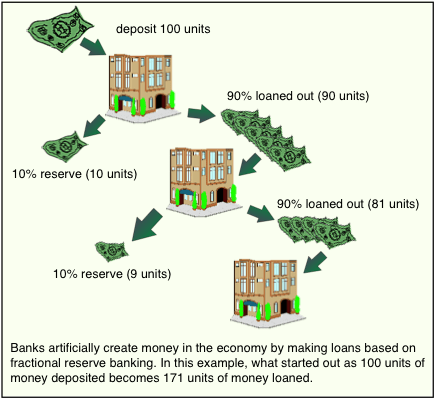 This allows banks to lend at least ten times what they have on deposit. In other words, they are lending ‘money’ they don’t have and that doesn’t exist – called ‘credit’ – and are charging interest on it. When you go to a bank to borrow, say £50,000, you have to provide ‘collateral’ by signing over your house, land, car or business, and this will go to the bank if you don’t meet the repayments. The bank is giving you nothing in return for all this. It types into your account £50,000 and that’s it. The £50,000 doesn’t really exist – it is a line of non-existent ‘credit’. Say you give someone a cheque for £20,000 from the original £50,000 and the recipient deposits the money into another bank. Now this second bank can lend ten times the £20,000 to other people, quite legally, and charge them interest. When you follow the original £50,000 from bank to bank, the amount of ‘credit’ that is created as it circulates the banking system is absolutely fantastic. We are talking here about a single loan that was created out of thin air in the first place. This is how the Rothschilds have come to own governments and most of the world. Interest on money is the key here. If money was put into circulation interest-free, and there was no interest on money in any form, it would return to its rightful role as a unit of energy exchange that overcomes the limitations of barter. It is when you introduce interest that the trouble starts because then you are making money from money and it no longer serves the people – it enslaves them. The bank credit/interest system means that the unit of exchange for human activity comes into circulation right from the start as a debt. Governments could create their own money interest-free to pay for public services, but instead they borrow it from the banking system and the population has to pay it back, plus interest. It is the same with individuals and businesses. Governments don’t create their own interest-free money; they are controlled by the families who also control the banks, most notably the Rothschilds. Abraham Lincoln was assassinated by the Rothschilds when he began to print interest-free money called ‘greenbacks’ to fund the North in the American Civil War. The Rothschilds were funding both sides in the Civil War, as they do in all the wars they engineer, but Lincoln eventually refused to pay their phenomenal levels of interest. The greenback system worked so well that Lincoln was considering making it the permanent means of government finance. This was the worst nightmare for the Rothschilds. The Rothschilds had Lincoln assassinated by John Wilkes Booth in 1865 and the greenback policy went with him. There is another vital aspect to understand about interest on money: when you take out a loan, the bank ‘creates’, in the form of ‘credit’, the amount of the ‘loan’. This sounds obvious and straightforward, except for one thing. You are not paying back only the loan; you are paying back the loan, plus interest, and the interest is not created, only the principle figure. This means that there is never even nearly enough ‘money’ in circulation to pay back all the outstanding loans and interest. It is a fatal flaw with regard to human freedom and it has been done purposely to ensure that bankruptcy and loss of property and possessions to the banks is built into the system. It is all part of the Rothschild energy-construct that flows the wealth and energy of the people in their direction. A fantastic amount of the money that people pay in taxes goes straight to the private banks to pay back interest on ‘money’ that the government could create itself, interest free, but doesn’t. ‘Privatisation’ is the selling of state assets in response to bank-created debt. The world’s poorest countries are handing over control of their land and resources to the Rothschild banks when they can’t pay back the loans made specifically to ensnare them in this very situation. ‘Third World Debt’ was manufactured to replace physical occupation of resource-rich or strategically-situated countries with today’s financial occupation. Once a country is indebted to the Rothschild bankers with non-existent credit, it is forced to hand over control of its affairs to the banks, the World Bank and the International Monetary Fund (IMF). These entities then dictate economic and social policy at every level. The World Bank and IMF are wholly-owned subsidiaries of the Rothschilds and always have their place-men at the helm. Poor countries struggling to repay debt are forced to cut spending on social programmes, health, education and humanitarian projects to pay the banks the ‘debt’ they owe. The world does not have to be in poverty and conflict. It is manipulated to be that way to serve the bloodline agenda for global dictatorship. Icke, D. (2010). Human Race Get Off Your Knees – The Lion Sleeps No More. Ryde: David Icke Books. Julian Websdale is an independent researcher in the fields of esoterica, metaphysics, and mysticism. Born in England, his interest in these subjects began in 1988, at the age of seven. Julian received his education as an engineer from the University of Bolton, has served in a Vaishnava monastery, and has traveled to over 14 countries since 2012 in his ongoing journey for knowledge. His work creates enthusiastic responses from inquiring minds across the world. You can follow Julian on Facebook and Twitter, or visit his website for more information. This entry was posted in Uncategorized and tagged bloodlines, control, credit, global elite, global finance, money, Moses Amschel Bauer, promisary notes, Rothschild, satanic black mgic, the Rothschilds, usury. Bookmark the permalink. Yes it is a matter of believe, but unless you walk out of the way society is structured, then you must have money. If I could do my life over (Oh to have known then what I know now) I would walk out of the false matrix and live a free life. An informative video on current economics, touches a lot of key basis which I have not found in any other video to date. Thanks Blue. We will get to start over. Money is the biggest religion on earth. Thanks for the video. Yes :-) Back to mystery school for us! Excellent, concise description of international finance and control by the greatly under-publicized Rothschild uber-money dynasty. Taking down/outing that Rothschild dynasty should be the focus of all who are concerned about the current maddening state of affairs on Earth, so your post here is greatly appreciated. Is it any small “coincidence” that Rothschilds live in Israel, the nation which now is murdering innocent Palestinians by the hundreds and receives over $3 billion/year from U.S. taxpayers – striking fear in American politicians who “dare” speak out against Israeli war crimes? I have always thought Zionism was created by Rothschild. It is not the home of the Jews, that is fabricated history. Yes, the money system is a black spot hanging over Gaia. Our debt based monetary system is also extremely destructive to the environment. Because there’s never enough money in the system to repay all the debt, you have to keep creating new debt and stripping the earth of natural resources to pay it off. 50% of the earth’s population lives in sub level poverty. It’s all backwards and those in power and those who are wealthy certainly don’t want change. If we the people just quit playing their game it would end. They are but a very few and we are so many. Most sleeping, but the time will come. It has to.